Whether or not you like warships, a visit to the Republic of Singapore Navy's Littoral Mission Vessel (LMV) mock Integrated Command Centre is likely to take your breath away. To see the full-sized replica of the area where RSN warfighters steer, fight and monitor the LMV out at sea, one first has to climb seven flights of steel stairs bolted to the side of a building to get to the top floor. The climb is worth it because the Singapore Navy has never had anything like it before. The mock up of the LMV - the RSN's latest warship type - is housed in an otherwise nondescript building at Singapore Technologies Marine's yard at Benoi Basin that is named, plainly and unimaginatively, as C Workshop. 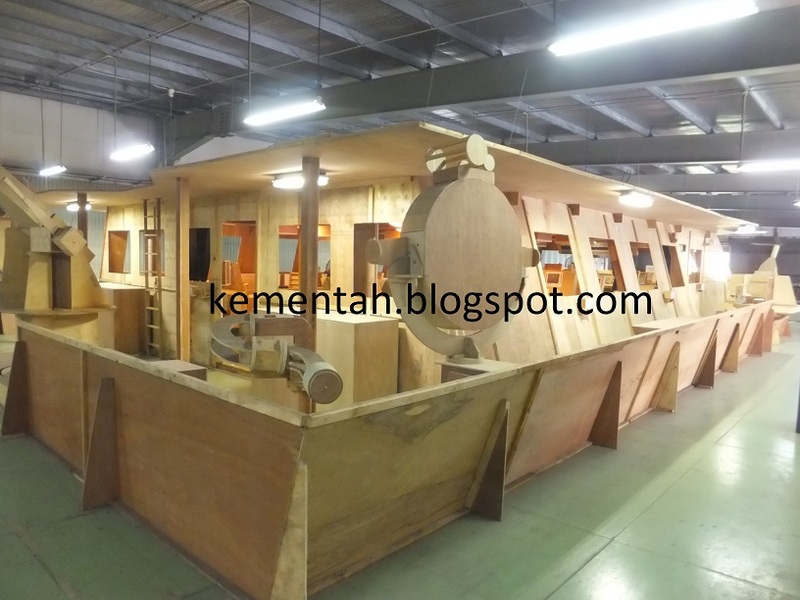 We're at the top floor of the highest point of the cavernous C Workshop, whose high roof was purposefully designed tall so ST Marine shipbuilders can mix and match assorted components sheltered from sunshine and rain to form the semblance of a ship. The architect who planned the workspace in the C Workshop's attic must have been working on a shoestring budget, because there is no passenger lift to the area. Visitors who brave the 98 individual stairs enter an area called the Mould Loft. While catching one's breath and as one's eyes adjust to the indoor lighting from the bright sunshine outdoors, we see a clean work area with LMV line drawings you cannot photograph before coming upon the centrepiece of the Mould Loft. It is hand-crafted entirely from plywood and is an amazing piece of handiwork. All parts which are supposed to move can actually do so and we soon see barrels of the 25mm Typhoon gun and the Hitrole 12.7mm guns at crazy elevation and azimuth, thanks to visitors with itchy fingers who cannot resist some touchy feely. The diopter can pivot and swing, just like a real one. The LMV mock up faithfully recreates the workspace, windows, doors, bridge wing and interior fittings of the real bridge superstructure. If submitted for the Singapore Biennale, this would instantly qualify as an objet d'art par excellence. If ST Marine didn't pay the mock up's builders well enough and they decided to go into the furniture business, the craftsmen would probably make a killing. The RSN has never had anything like this done for any previous class of warship designed and built in Singapore, said Military Expert 5 Tang Chee Meng, Principal Engineer for the LMV Project Office, RSN. Forget computer-aided design and all the funky software which allow naval architects to design warships on a desktop. 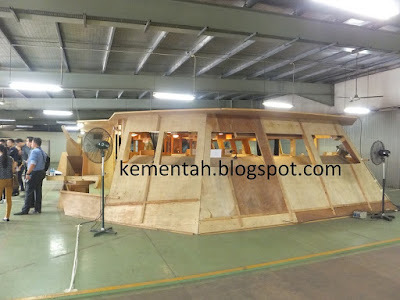 The LMV mock was hand made to test and refine design concepts from the LMV project team. Just as a show flat allows potential home buyers to try-before-buy, the wooden wonder in ST Marine's Mould Loft was painstakingly built by four exceeding talented craftsmen in just two months to allow the LMV project team to see and experience what the Integrated Command Centre would look like. Placement of screens, the elbow room between work stations and bum wriggle room that divides the phalanx of flat screen displays used to furnish the air and sea situation picture have been tried out and modified in the past year and a half, said Lieutenant Colonel Chew Chun Chau, Head of the LMV Project. The result is a floor plan for an Integrated Command Centre that the LMV's future users have seen, tested and commented on, long before any of the warfighters even stepped foot aboard the real thing. The first real LMV, RSS Independence (15), was launched this morning at ST Marine's Benoi yard by Mrs Ivy Ng, the wife of Singapore's Minister for Defence, Dr Ng Eng Hen. This unprecedented attention to detail stems from a radical departure from previous warship design templates which dictated that the spaces where sailors sail, fight and monitor the warship's vital signs should be placed in separate compartments. On the Independence-class LMVs, the bridge, Combat Information Centre and Machinery Control Room are housed in the Integrated Command Centre to "achieve greater operational effectiveness and efficiency, especially during maritime security operations", said LTC Chew. The wooden mock up gives designers firsthand experience seeing how floor space and work processes can be optimised. This replica is complemented by yet another mock-up somewhere else in Singapore. 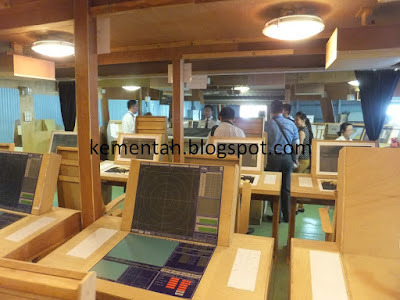 This LMV replica is an interactive mock up where computer screens at battle management stations actually work and where the view outside the window is a computer simulation of the LMV's future work environment. Working quietly and without fanfare and out of the public eye, the LMV project team has used the mock ups to stress test ideas and warfighting concepts. All this effort to give Fleet RSN a smarter, faster and sharper way of hunting and killing hostile forces in the littoral zone close to shore and in confined waterways. Today, the wooden mock up was finally declassified and put on show. It is a sight to behold. Starboard bridge wing forrard, showing the Oto Melara Hitrole 12.7mm remote weapon system in B-gun position. 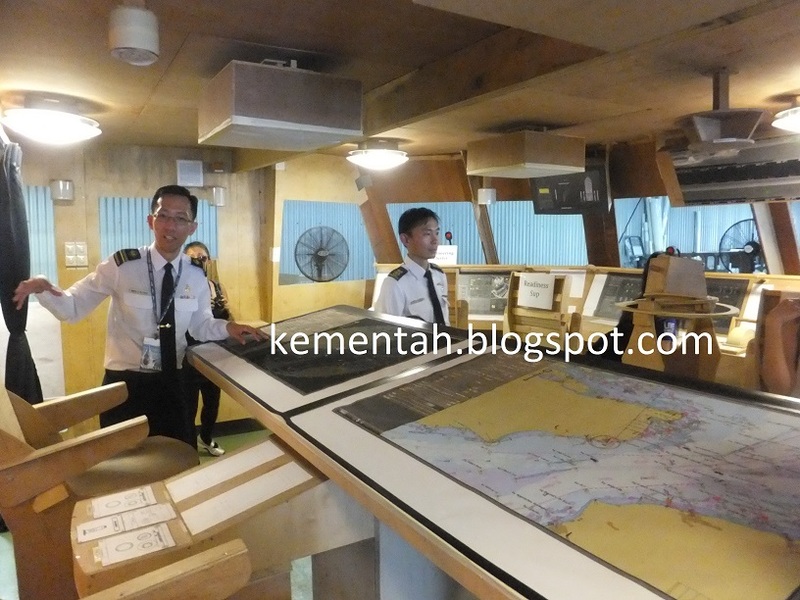 Commanding Officer and Principal Warfare Officer duty station, with mock ups of the 46 inch touch screen. Looking aft, with the work stations for various functional areas, called clusters, laid out exactly as in a fully fitted LMV. Looking forrard in the Integrated Command Centre. 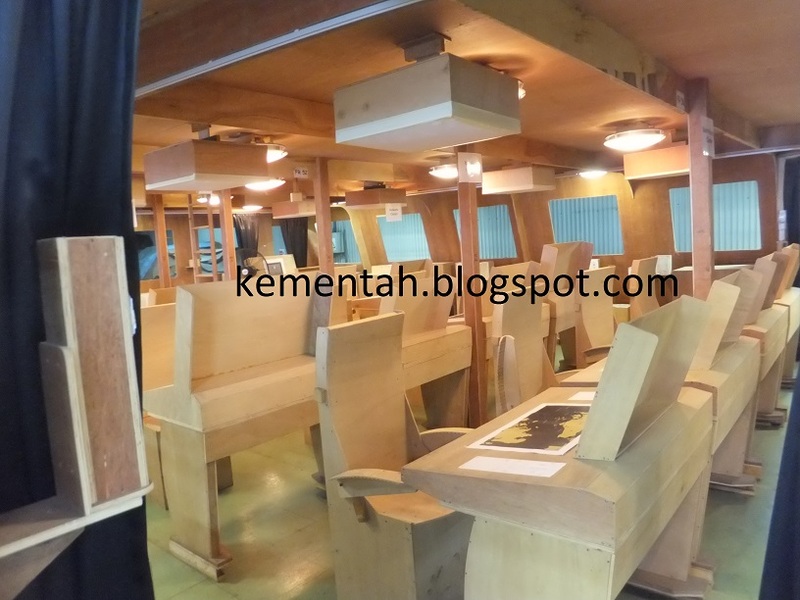 Paper printouts mimic the displays and control panels that the LMV crew would use on a real ship. 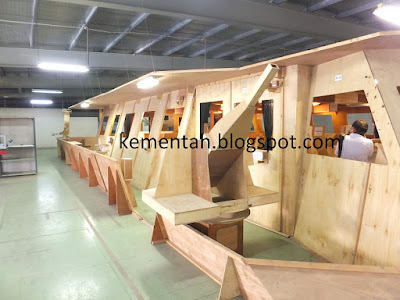 Starboard bridge wing, aft: The water monitor (front left) and Long Range Acoustic Device with integrated Xenon light have been faithfully recreated out of plywood. These devices can move in the same manner as the actual devices. The level of craftsmanship seen on the LMV mock up is commendable. I assume that to visit, one would have to be on official business e.g. media or industry purposes. 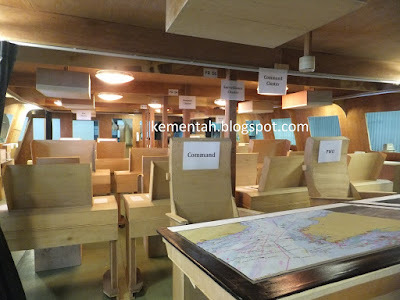 Too bad the average Singaporean is not able to visit and view the hardware of our Navy. No CIC metal box in the bowels of the ship? Amazing how much the LMV design borrows from the French Gowind. Combined CIC-Bridge, panoramic 360 bridge. 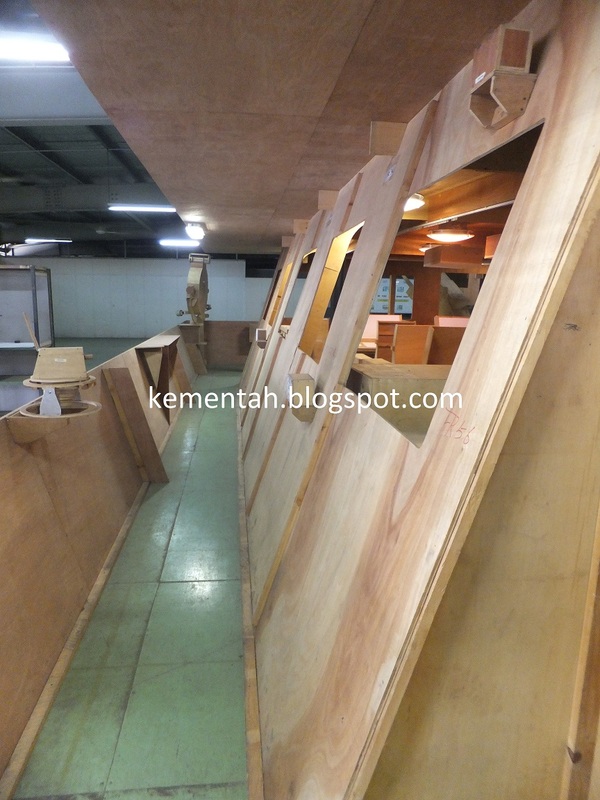 Even the stern dual RHIB launch design. 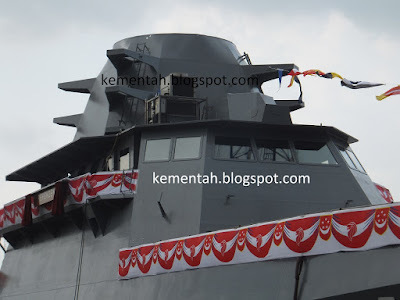 The Malaysian SGPV-LCS and our LMV are sisters at sea. I also note how much of the LMV design has incorporated the need for enforcement duties in quasi-military settings, clipping hull, LRAD and high-power hoses. As much as these fittings are useful in anti-piracy, they are also appropriate when one is policing EEZ against foreign coastguard or fishermen in a non-lethal ROE environment. However, we do not have an EEZ or an immediate piracy problem, do we? Is it our intent to come to the aid of our friends in the SCS? Awesome looking mock up. Thanks for the update! "This unprecedented attention to detail stems from a radical departure from previous warship design templates which dictated that the spaces where sailors sail, fight and monitor the warship's vital signs should be placed in separate compartments." Not separated... one good hit and the ship is effectively lost. I'm actually quite surprised that it's an indoor mock of the integrated command centre and not a full-scale outdoor 'test' unit with integrated electronics. Navies have been using such outdoor mocks to sort out a warships electronic systems, especially these days where multiple fixed AESA panels are used, to ensure optimium coverage and reduce signal interference. Most recently, China built a mockup of the rumoured Type-55 'cruiser' in Wuhan, right next to the mockup of the Liaoning aircraft carrier. I just had a chance to read the Janes coverage - not enthused with the choice of VL-MICA (Sea Ceptor can use the same launcher and has better FC & range). Apart from that and a heli-deck this class seems rather limited in warfighting in comparison to other surface combatants of the same tonnage. Once again, I want to gripe about having the combined bridge and CIC team in the bridge. The LMV is not a harbour tugboat in which case situation awareness is necessary and directed towards the need for precise maneuvering of the vessel. Having the weapons specialists and command elements right at the bridge opens them to vulnerability even in a situation other than war (for instance, clipping or water-cannon against Greenpeace). I am of the opinion that being physically detached from open sight of the situation gives command and weapon specialists the advantage of being less emotional or jittery in their decision-making. I think the LMV design team has been unduly influenced by the French Gowind. The French may be fashionable but they are seldom right. Accoding to the Janes APDT reporter, the 360 degree bridge and integrated command/control concept is "uniquly Singaporean..."
Gotta say he got it right about the ship weight... the Victory Class are apparently pretty poor open water boats due to being top heavy.